PHOTO BY NICOLE WALBY Lakota High School senior Maryn Klaus poses with her plaque and poster board, which earned her one of four spots as a semifinalist for the National Agriculture Proficiency Awards. KANSAS — A Lakota High School senior made it as one of four national finalists through the Agricultural Proficiency Awards in the FFA. 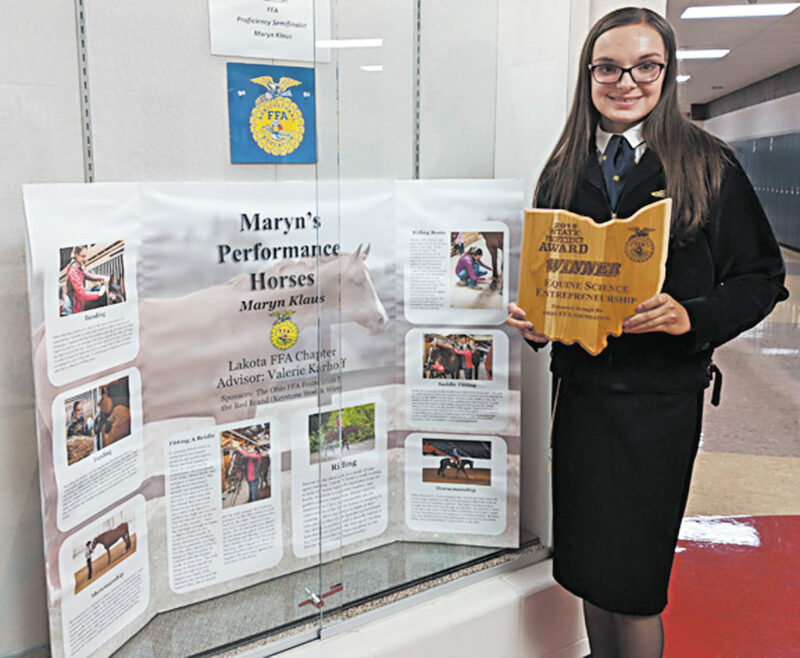 Maryn Klaus earned one of four top spots in the state Equine Entrepreneurship Proficiency in May. She now has submitted her application to the national level and is to be interviewed at the National Convention this October. “It was very shocking at first,” Klaus said. To win at state, Klaus had to put together a poster and be interviewed. This was Klaus’ first year applying in the equine science proficiency area. In her proficiency area of entrepreneurship, Klaus’ supervised agricultural experience was related to her ownership of an agribusiness or agriculture-related enterprise. Here, she planned, implemented, operated and assumed financial risk of ownership. In her project, she conducted services at horse shows through her business Maryn’s Manes, such as banding, feeding, showmanship, fitting a bridle, riding, fitting riding boots on horses, saddle fitting and horsemanship. “It is really cool that I get to represent my school and chapter at the national level,” Klaus said. Klaus said she has always enjoyed agriculture and likes to do anything that allows her to work with her horses. Klaus has been working with horses since she was six years old, when she received riding lessons as a birthday present. “I developed a passion from there,” she said. She now has two horses, but has trained and worked with many over the years. “I love how they have different personalities,” Klaus said. If she wins an award at the national convent, Klaus would earn two plaques and $1,000. Klaus plans to attend a four-year college following high school where she plans to major in biology on a pre-med track to pursue a career as an emergency room physician. Klaus said she will continue her work with horses.